Park at 518 Maple Street, Gainesville, GA and walk across the street to the metal warehouse building. Look for the black mailbox. I'm hosting my only open studio event of 2017 this weekend as part of the Quinlan Visual Arts Center Studio Tour & Sale. I'll have new work (herbarium prints on kozo and my shell series) available for purchase, a one-day-only sale on all framed prints and encaustic panels, special clearance items (open-edition prints and books), plus mix-and-match photo notecards (great for holiday gifts). My brother, Chris Romberg, who builds beautiful wooden canoes (see below) in the space adjacent to my studio, will have his boatbuilding studio and woodworking shop open. He has a couple of boats under construction and you can watch him work. We'll have desserts and other snacks from Two Dog Restaurant to enjoy. This is a very casual event; come as you are. $10 tickets may be purchased online or in the studios and benefit the Quinlan Visual Arts Center. Stamped tickets may be used for a 10% discount at the Quinlan Gift Shop. Two additional studios and galleries are on the tour, as well. We hope to see you on Sunday! The Quinlan Art Center is sponsoring an Artist Studio Tour and Sale in Gainesville's Midtown area on Sunday, November 12, from 1-4pm. I will be participating in the tour, along with my brother, Chris Romberg, who has a boatbuilding shop in the space adjacent to my studio. I will have photographic and encaustic works in progress and Chris will be building a wooden canoe. The event is open to the public. Tickets are $10 (to help the Quinlan offset costs) and may be purchased online or at the door the day of the event. Altogether, four studios/galleries will be on the tour. See them all and use your ticket for 10% off your next purchase at the Quinlan Gift Shop. Agave stricta, 20"x20" photo encaustic on wood panel by Lee Anne White. Handcrafted wooden canoes by Chris Romberg/Wahoo Creek Canoes. Come see how both are made. Brenau Galleries' Allison Laurecella (l) and Nichole Rawlings (r) are putting the final touches on the President's Summer Arts Series, opening Thursday in Gainesville. As with any key event, there is a flurry of activity in the days preceding the opening of an art exhibition. Postcard invitations must be mailed, social media posts must be made, interviews may be scheduled, catering must be finalized, artwork must be delivered and, of course, the show must be hung! 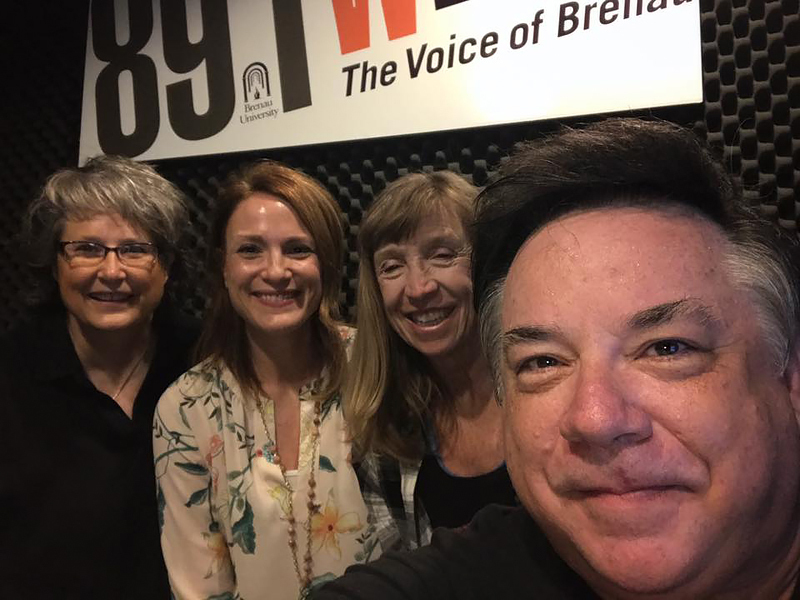 Brenau Galleries Director Nichole Rawlings and Galleries Manager Allison Lauricella are the ones doing most of this leg work, as they do for all of the exhibits and openings at Brenau University. Other departments, such as public relations, may get in on the act as well. Yesterday, they published this nice article (CLICK TO READ), which I've now seen several places. The artists are busy, too. At this point, our task is to help get word out. Today, we had a group interview with Jay Andrews on WBCX 89.1, the University's radio station. (CLICK TO LISTEN to the interview online.) And then we dropped by Sellars Gallery in Simmons Visual Arts Center on Front Campus to see how the hanging was going. There were still ladders and other equipment in the room, but all of the pieces were on the walls and the room looked beautiful. 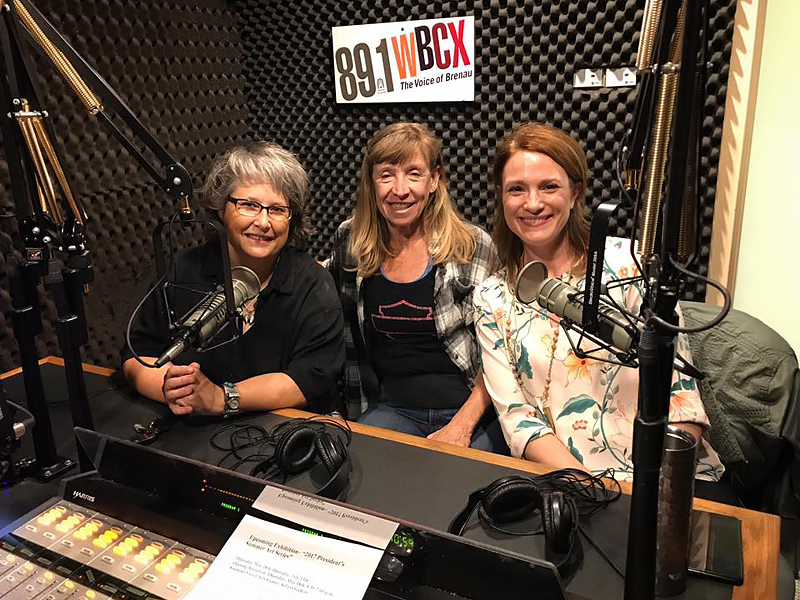 Patricia Fabian, Sarah Claussen and I were interviewed by Jay Andrews in the WBCX sound booth this morning. (Artist Christie Gregory was unable to join us.) Listen live (89.1) this Wednesday and Thursday, 7:05am and 12:15pm, or click on the link above to listen anytime online. The opening is just two days away, but I believe we are all ready! Thanks to Brenau, and especially to President Ed Schrader, for inviting me to participate in the 2017 President's Summer Arts Series. Hope to see you at the Opening Reception on Thursday from 5:30-7:00 pm. Brenau University just published a very nice article about the four artists (of which I am one) whose work will be featured in this year's President's Summer Art Series. The exhibit opens this Thursday, May 18, with a reception in Sellars Gallery from 5:30-7:00 pm, which is free and open to the public. The exhibit will remain open until July 13. Other artists include Sarah Claussen, Patricia Fabian and Christie Gregory. CLICK TO READ more about these artists and their work. And then come on by this Thursday evening to meet the artists and see their work in person! Featured artists include (l-r) Sarah Claussen, Patricia Fabian, Christie Gregory and Lee Anne White. I longed for more room to in which to spread out and work. I’m in a much larger space now and have managed to round up several extra tables and shelves--mostly from around the warehouse. Now I can work on multiple pieces at the same time and leave most of my equipment set up, ready for use when I need it. What a difference this makes! I also love the high ceilings and big windows. I needed to better separate home and work. This has been a very positive change, though the transition is not complete. I don’t have Internet at the studio, so I still handle correspondence, photo submissions and research at home. I thought setting up a hot spot from my phone would work, but I blow through hi-speed data in no time, even when I’m careful. Of course, it's one less distraction at work. I'm spending more time creating and less time online. Still, it is inconvenient and cuts into my home time. I wanted to feel a greater sense of connection and community. This has been more challenging than expected, as I haven't shed my hermit tendencies. Once I get there, I like to work and don't really want to leave. That said, perhaps the best part of this entire move has been seeing more of my family on a regular basis. I'm closer to my mom and cross paths with one or both of my brothers every few days. I wanted to have a place for hosting open studio events and classes. My first open studio is this weekend and I may introduce my first class this summer. I worried about the commute. It's mostly a reverse commute, so the drive is generally good thinking time and it helps me shift my focus from home to work and then back again. Also, I love crossing Lake Lanier each morning and evening. I could do without the evening commute, as I'm usually tired, driving directly into the sun and facing heavier traffic. Still, it beats some of my previous Atlanta commutes. And finally, I worried about Boone, our Airedale terrier. He’s 10, an indoor dog, and was used to my being home. He has become a studio dog. He loves the commute (and barking at horses along the way), seeing other people, and walking along the beltline park (just a block from the studio). The bottom line: I feel more more focused and creative, and sense this was a good move. I hope you’ll come see me, my new space and what I’ve been working on tonight or tomorrow! From Birmingham to Fernandina Beach: It's Time for Shrimpfest! With barely time to catch up on sleep from last weekend's Magic City Art Festival in Birmingham, I'm off again--this time to Fernandina Beach, FL, for the Isle of Eight Flags Shrimp Festival. This is a special event for me, as most of the work I feature in my booth was photographed in the marshes and along the shore here on Amelia Island. I usually go to Fernandina Beach for a quiet retreat, but this week it will be rocking with activity. More than 100,000 people are expected to attend the event, which kicks off with a parade on Thursday and a spectacular fireworks display on Friday. In addition to 300-plus exhibiting artists and craftspersons, there will be antiques, a food court featuring shrimp prepared every way you could possibly imagine, and a pirate invasion. (You'd be amazed how many pirates still live in this town.) Please note: The outdoor arts and crafts show takes place on Saturday and Sunday only. My booth will be located on North Second Street near the Palace Saloon (Florida's Oldest Saloon), Dog Star Tavern (which actually permits dogs) and the Island Art Association building (which is shrimp colored and covered in tile mosaics). Although I have attended Shrimpfest many times, this will be my first year as an exhibitor. It's really a great event in a town that knows how to have a good time. Come join the fun! By the way, this is a great little restaurant town. If you're looking for something other than shrimp food court, here are a few of my favorite restaurants: Karibo, Arte Pizza, 29 South and The Salty Pelican (downtown in the historic district) and Sandy Bottoms and Sliders (on the beach). And every Saturday of the year, there is a wonderful little Farmer's Market at the corner of Centre and Seventh Streets. The Book Loft in Fernandina Beach is hosting a book signing featuring my photo book, The Mutable Sea. I'll be at their wonderful store in the downtown historic district on Tuesday, March 31, from 1-4pm. The book features more than 50 seascapes photographed from local beaches. If you're in the area, please come and bring your friends. It's a great little bookstore! The Book Loft, 214 Centre Street, Fernandina Beach, FL. Tuesday, March 31, 1-4pm. Next week, I'll be heading south for the Old Town Art Show in historic downtown St. Augustine. This juried show features both local and national artists and is a great way to kick off springtime. If you're in the area March 28-29, drop by Francis Field, say hello, and check out all of the great artwork. I'll be there with my tent, prints and some new encaustic pieces. The show is Saturday and Sunday from 10am-5pm, rain or shine. Chastain Park Arts Festival, named "Atlanta's Best Local Festival" by Best Self Magazine, returns on November 1 and 2. I'll be there, pitching my tent with up to 200 other local and regional arists and artisans. With colorful fall leaves and a beautiful tree-lined Park Drive creating a stunning backdrop (and, hopefully, some crisp fall weather), it will be the perfect place to spend a Saturday or Sunday afternoon. Come enjoy the art, crafts, live acoustic music and food trucks. Get started on your holiday shopping, choose a special piece for yourself or simply enjoy the atmosphere and activities. Admission is free and you'll be supporting both the arts and the Atlanta Foundation for Public Spaces. Chastain Park Art Festival, Saturday, Nov. 1, 10am-6pm + Sunday, Nov. 2, 11am-5pm. GPS: 4469 Stella Drive, Atlanta GA 30327. Text me at 770.329.5449 once you reach the park and I'll let you know where my tent is pitched. See you there! The Gallery at Digital Arts Studio is featuring Behind the Lens, the annual member show for Women in Focus, during Atlanta Celebrates Photography. The show opened to a packed house this past Saturday with works by Cindy Brown, Debora Cartagena, Myrtie Cope, Bobi Dimond, Harriet Dye, Sheri Garza Pope, Jennifer Giliberto, Roth Gogel, Valerie Gruner, Ellen Hayes, Jan Kapoor, Lynne Klein, Carolyn Meltzer, Carolyn Miller, Chris Mitts, Niki Murphy, Maureen Anne Petrilli, Gittel Price, Lesley Anne Price, Linda Rathke and, yours truly, Lee Anne White. Behind the Lens runs through Saturday, November 1. Digital Arts Studio is located at 1082 Huff Road, Atlanta GA 30318. For information, call 866-352-9979.